First lady Melania Trump made her first public appearance since surgery for a kidney ailment in mid-May at a White House event Monday evening honoring service members killed in action. Trump, wearing a black dress, sat in the front row at Monday's Gold Star Families for Peace reception at the White House, taking the time to shake hands with families, according to a Gold Star daughter at the event. Greene told ABC News she was at the event to honor her dad, Lt. Col David Greene, a Marine Corps Helicopter Pilot who was killed in Iraq in 2004. Greene is a reporter for the Daily Caller. Melania Trump, center, with President Donald Trump, attended her first public event since kidney surgery at a reception honoring Iraq War victims on Monday, June 4, 2018. Gold Star Families for Peace is an organization that provides support for fellow members who have lost family members in the Iraq War. One of their stated goals is also to bring an end to the war. Greene tweeted that the president joked about the media’s speculation about the first lady's absence. She had emergency surgery, what was described as embolization procedure involving her kidney, on May 14 at Walter Reed Medical Center, the White House said at the time. "He laughed off rumors of them breaking up, saying it wasn’t happening. “Isn’t that right honey?" Greene tweeted. After the event, the first lady's office issued a statement thanking the families who came to the White House. "To all those who have lost loved ones in service to our country, our nation grieves with you," Melania Trump said in a statement. 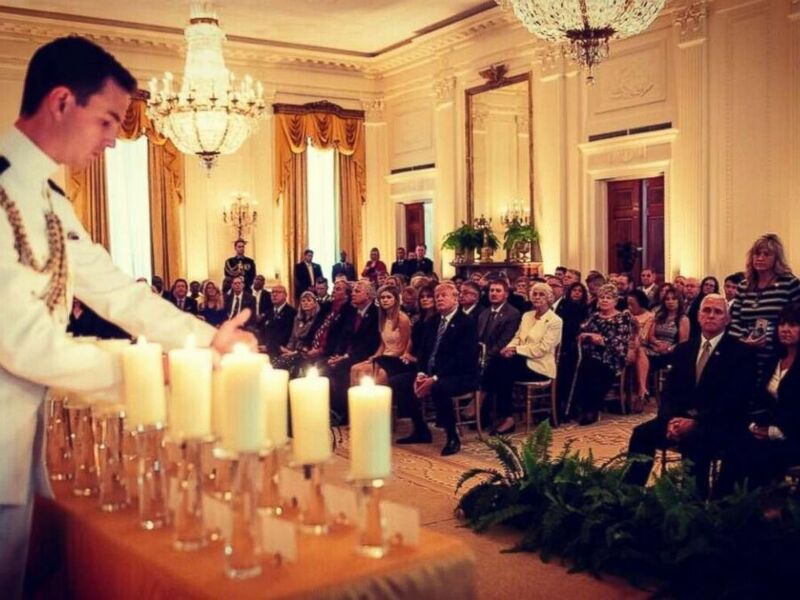 She tweeted photos of the event as well, saying, "Tonight @POTUS & I were honored to pay tribute to our fallen heroes. Thank you to the Gold Star families that joined us in celebration & remembrance."